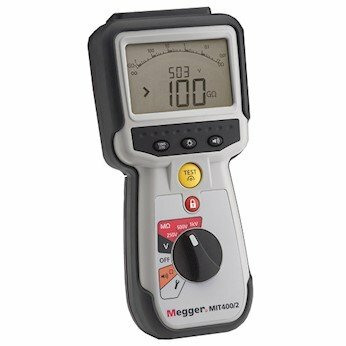 The enhanced Series Megger MIT400/2 insulation and continuity testers offer a wide range of applications from electrical installations, cable testing, motor testing, automotive, ESD, panel building, avionics, and maintenance. These compact units provide insulation testing up to 1000 V and 200 gΩ range. A variable range allows any intermediate voltage from 10 to 1000 V in 1 V steps. Each Tester is protected by a rubber molded outer casing and comes with a IP54 weatherproof rating. Other features include a pass/fail indicator and Test voltage display. What's included: red/black silicone Test leads with probes and clips, remote switched probe (except MIT400/2), six AA batteries, carrying case, calibration report supplied by the manufacturer, and Manager software CD (Mit430/2 only). more accurate testing without the risk of overvoltage damage single range, faster continuity testing from 0.01 Ω to 1 mΩ stabilized insulation Test voltage is accurate to 2 percent live circuit detection for added protection 600 V true RMS AC and DC voltage measurement recharging options now available.